Orbitz. Trident. Juicy Fruit. We love our chewing gum here in America. But what if your orthodontist recommends braces to straighten your teeth? Can you continue chewing your favorite brands of gum or must you abandon the habit until your treatment ends? In the past, the answer was always a definitive “no.” But nowadays, we give our Gorman & Bunch Orthodontics patients a less emphatic “yes and no” reply. Here’s why. Are you making these 10 bad habits with your braces? Today’s braces consist of more durable brackets and wires, which significantly reduce the risk of damage caused by chewing gum. And so we can now be more flexible in permitting our patients to chew gum while in braces—as long as it’s sugar-free chewing gum. Strengthens tooth enamel by delivering more calcium, phosphate, and fluoride to the mouth. But not all gums work this way. We always discourage our patients from chewing any gums that contain sugar. Why? Because sugar stimulates the aforementioned bacteria-causing acid in your mouth, thereby negating the merits of increased saliva. Additionally, because of its chemical makeup, sugary gum can be stickier than its sugarless counterpart. And this means it can more aggressively affix itself to metal appliances, getting wrapped up in wires and pulling elastic ties off brackets. And even if it doesn’t cause any physical damage to your braces, sugary gum can still lead to cavities by exposing your teeth to high levels of sugar for an extended time. The Gorman & Bunch Orthodontics team suggests that, while in braces, you only select sugarless gum, chew it in moderation, and always brush and floss around your wires and brackets after eating. 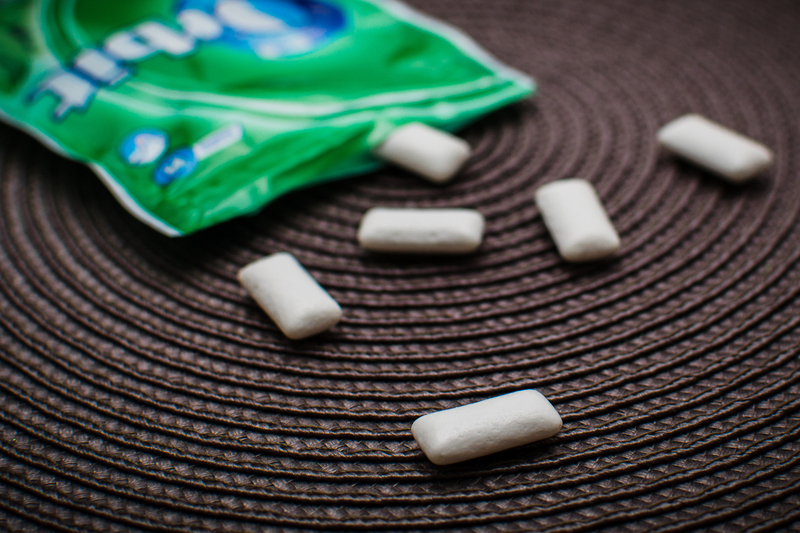 Be sure to check this list of sugarless chewing gums that meet ADA criteria for reducing cavities. And as always, we’ll be happy to answer any questions you may have about your braces and preferred chewing gum.